October is always our biggest reveal of the year, and this was no exception. So, without further ado . . .
Marylee was inspired by Elin Nobel's beautiful clamped, hand-dyed fabric. Marylee has been saving this special fabric for several years, wanting to do justice to the beautiful colors and design elements. 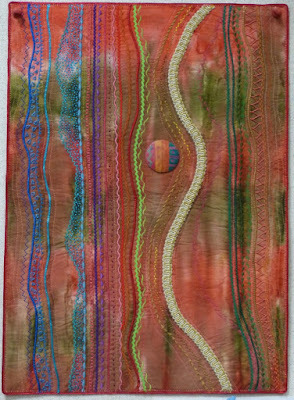 At last, she found a design that inspired her to use some of her Nobel fabric stash. While circles and rings are ordinary and simple, they are nevertheless beautiful in their own right and represent sacred symbols to many faiths: infinity, togetherness, wholeness, everlasting life and repetition. So much symbolism for such a simple circle! Claudia was inspired by an old barn in her neighborhood that must have been a beautiful structure at one time, and even though it has been neglected, its beauty still shines through. The body of the barn is made of different shades of red batiks and 'Grunge' fabrics. Claudia used white batting for the snow and white Grunge fabric for the border. The greenery and trees were thread painted in several tones of green quilting threads stitched using a machine quilting hoop with layers of Solvy and tulle. She used clear and black monofilament thread to secure the body of the barn and the greenery. Finally, she used acrylic paints for the barn itself to dirty it up and age it, and for the splashes of white for the snow. This is the second in a series of three inspired by the book Stupendous Stitching by Carol Ann Waugh and the videos on her website. Maria used cotton batik fabric with 16 rows of satin rattail binding, 4 rows of rickrack, 4 rows of hand stitches, 1 row of beige trim and one wooden embellishment painted to match the colors in the background. Maria wanted to use simple techniques so that the beauty of the fabric would shine through. Over a period of 40 years, Wilson Bentley took over 5000 photographs of snowflakes, declaring at the end of his work that no two were alike. Kenneth Libbrecht at Cal Tech bears this out -- snowflakes created in a laboratory under identical conditions still remain unique. 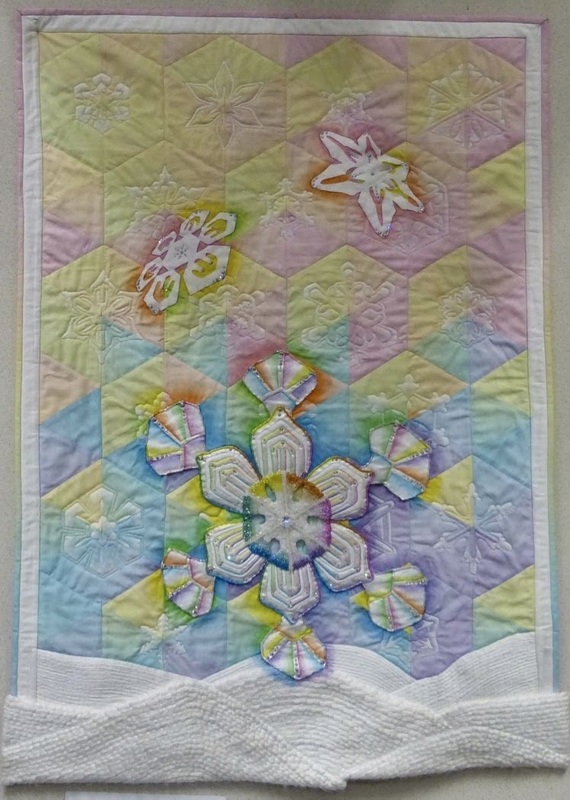 Inspired by the unique beauty of snowflakes, Kathryn created this quilt. She used hexagons to create a background that reflects the six-sided crystalline structure of snowflakes and laid them out in the color pattern of a prism. She quilted one of Bentley's snowflakes in each hexagon, shading them with white Tsukineko ink. The two tumbling snowflakes and the white border are glitter tulle fused to cotton. 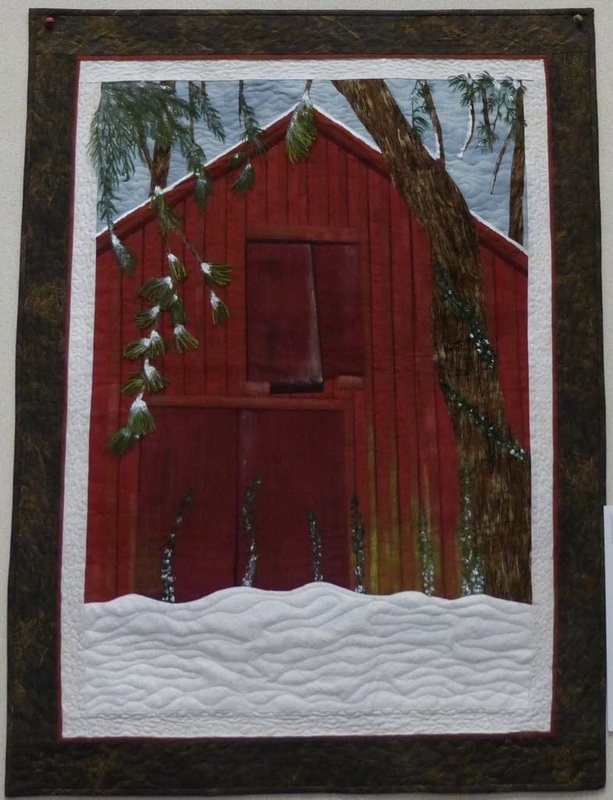 The background snowdrift at the bottom is white embroidery thread couched onto cotton. The foreground snowdrift is a stand alone piece of couched yarn, faced and appliquéd to the background. The large snowflake was made in three pieces, painted with Tsukineko frost ink blended with prism colors. After the three pieces were painted and the center was beaded, they were assembled and bead-appliqued to the background and the foreground snowdrift for increased 3D perspective. She used Inktense pencils and fabric medium to create 'halos' around the snowflakes. "Hope and Strength: Six Generations"
Jackie found inspiration in old family photographs and the saying, "Strong women: know them, be them, raise them." To Jackie, strength is derived from hope, hence the title, "Hope and Strength." She wanted a striking color palette for the portraits. 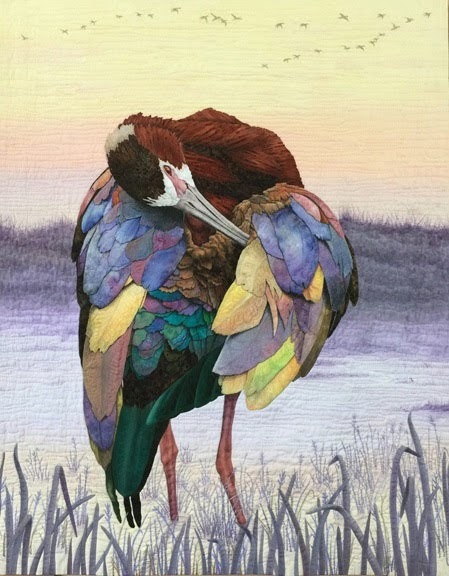 To create the colored photographs, she printed black and white photos onto cotton, colored them with oil pastels (for their intense color) and sprayed them with fixative. Jackie reminds us that none of these women were rich, famous, or powerful, but they -- and others just like them -- have made, and continue to make, us who we are. Their hope and strength, born in adversity, is instilled in us as we carry on. 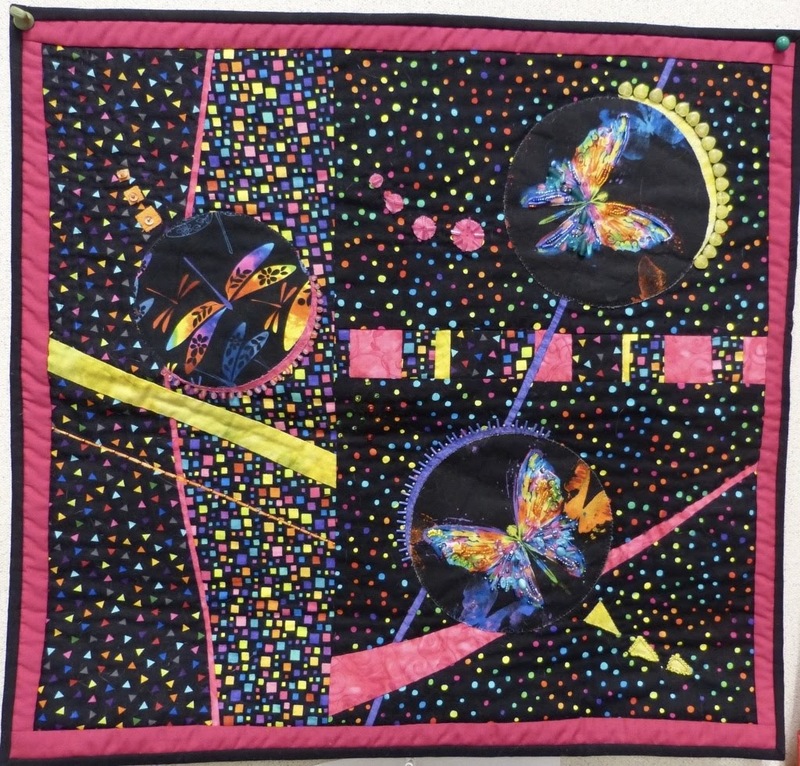 In July of 2017, Lynda submitted a quilt entitled "Pine Tree Silhouette" for the Rhythm of Life challenge. One of the critiques she received suggested that the silhouttes extend from edge to edge, so she decided to create a 'do-over.' 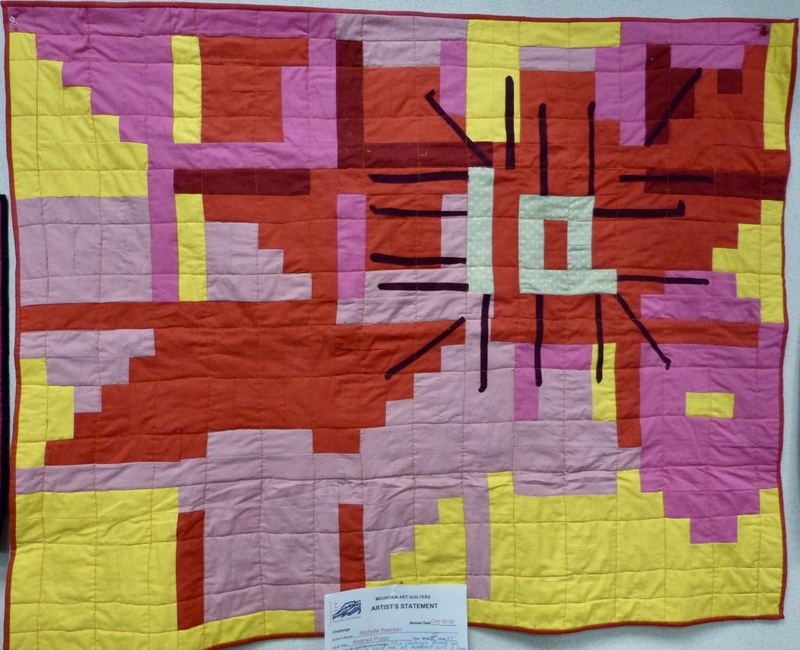 This quilt was constructed of commercial fabric with wool batting and cotton threads. Always going for the bling, Lynda wanted this piece to be stark with a dark forboding. The roar of a hurricane of fire rushing down a California canyon was the inspiration for this piece. Hundreds of homes were targeted and burned while residents attempted to outrun the flames in the dark of night in the community of Santa Clara, California. 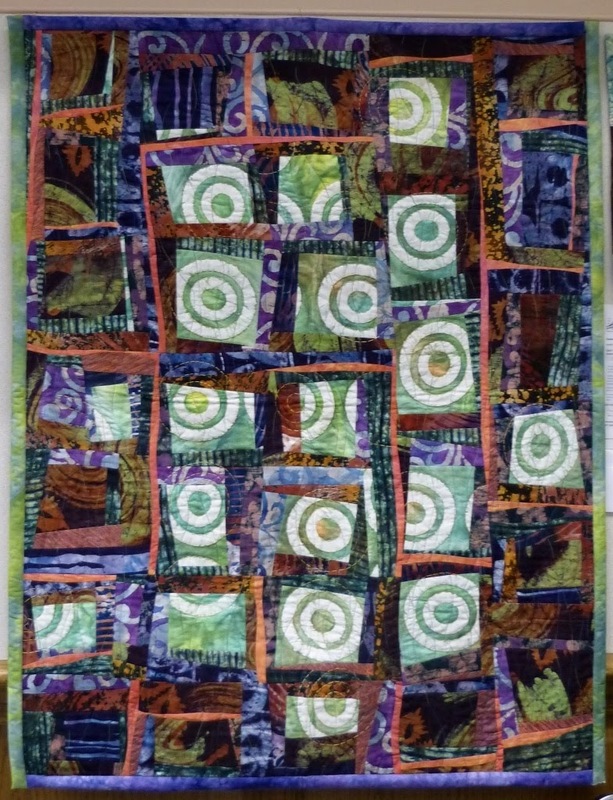 A batik with target-like circles became the the centers of the pseudo-log cabin blocks that formed the structure of this piece. 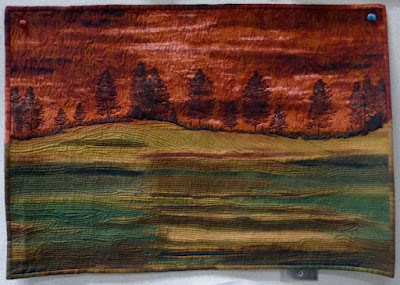 A large variety of African batiks provided just the right feel for the dark night background, with one of Joan's orange hand-dyed cottons peeking through the landscape, warning of the oncoming flames. 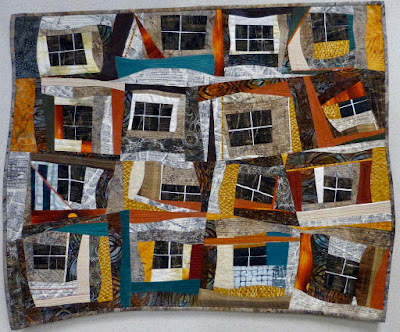 Joan found that machine piecing the 'blocks' with spacer scraps was an enjoyable challenge, adding just enough orange fabric to suggest the tongues of fire encroaching on the formerly peaceful neighborhood. 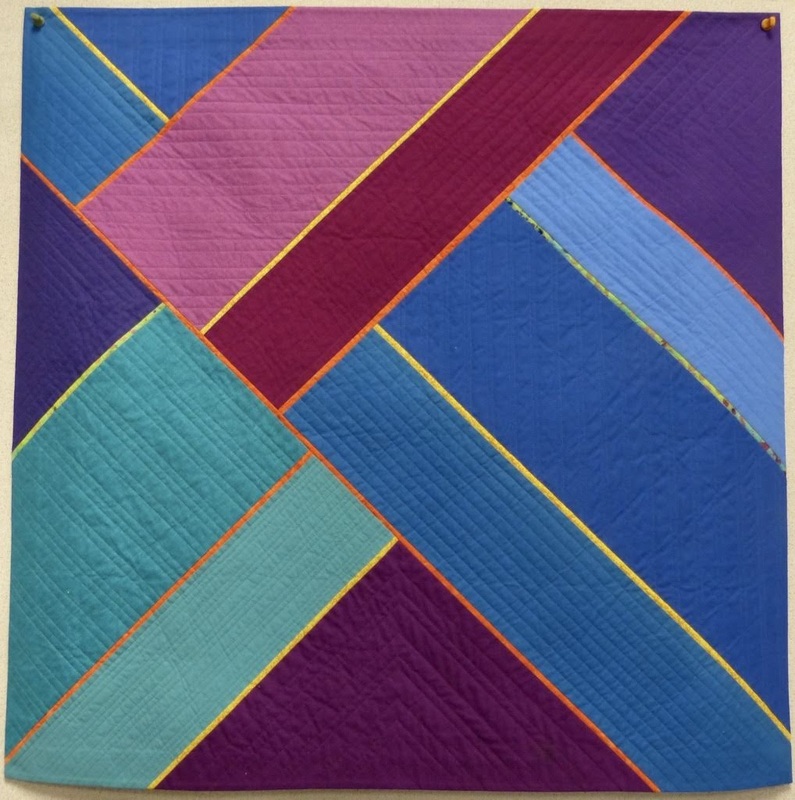 After simple machine quilting to secure the quilt, Joan finished the piece with extensive hand-quilting using perle cotton. The challenge, "The Great Outdoors," inspired Sue's top panel -- for her, there is nothing greater in the great outdoors than the sun, moon, and stars. She researched the patterns of the constellations so they would be somewhat accurate, and the backdrop was created so that she could add more stars -- five constellations representing herself, her husband, her three children, and her three favorite constellations representing her three cats. 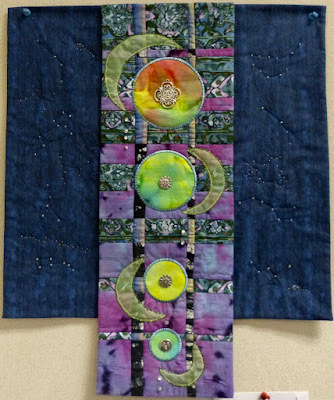 Sue used commercial cotton fabrics, cotton batting, glow-in-the-dark thread, beads, and special buttons. "Packing in to Point Reyes"
Jane's inspiration was her back-packing trip to Point Reyes, the photos and memories she brought home. She really wanted to include her back-packing permit which she re-created in fabric, and her biggest challenge was finding the right layout to fit everything in. Jane incorporated photographs and postcards printed on fabric, lettering cut with her Silhouette Cutter, a hand-painted map, batiks and hand-dyed fabrics. 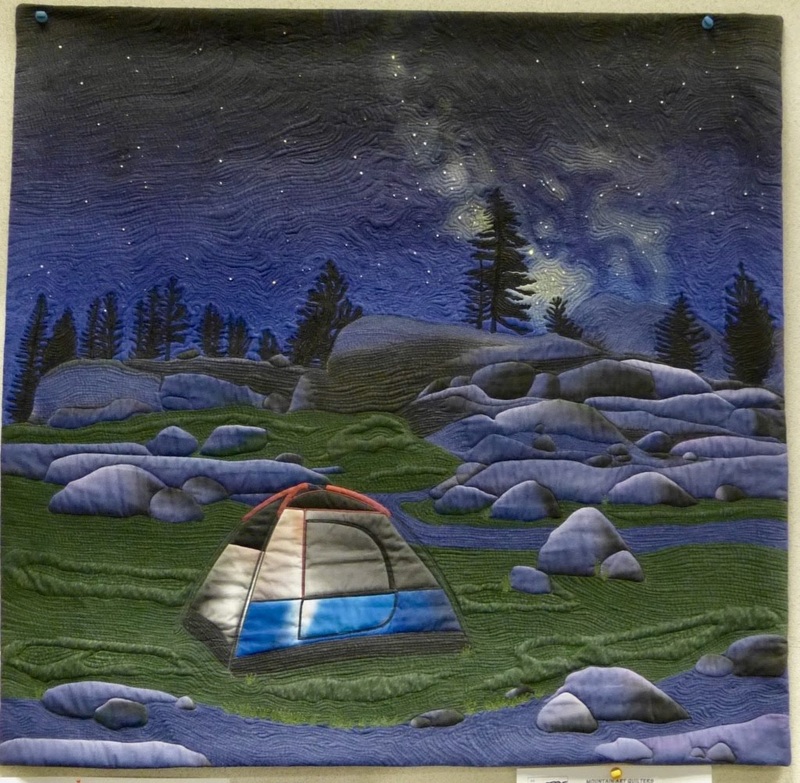 "The Great Outdoors -- Under the Starry Sky"
This quilt was inspired by Robin's experiences camping and viewing nature under the starry sky. She spent time this summer planning out the composition and subjects, photographing the night sky and a tent illuminated from within, and the scenery at Loon Lake. Using her photos as references, she drew all the objects in Adobe Illustrator, changing colors as needed to create a night scene. When the image was finished, Robin had Real Graphics output it on cotton cloth, embellished it with heavy thread painting for texture and design, and added crystals to enhance some of the stars. Robin, a space enthusiast, shares that the sky is an accurate depiction of the stars, planets, and Milky Way as seen in August of 2018. Jeanie is in love with this monument, in love with history, and in love with architecture! She has passed by this barn almost every day and has photographed it many times starting in 2012, but she is not alone -- many artists have drawn, painted and photographed it. 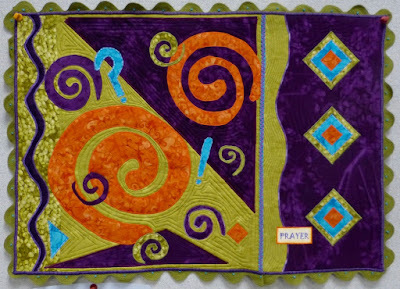 Jeanie created this quilt using needle turn appliqué using appropriately colored Invisifil thread and a size 11 bendable straw needle. She also used chalk pastels to 'weather' the old barn. Her hand-quilting meandered where her fancy took her, employing circular motifs where appropriate and a variety of quilting threads. 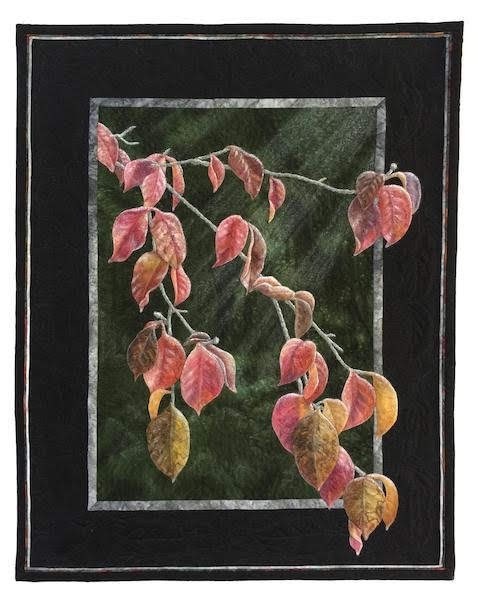 Jeanie always uses Thermore batting for her hand-worked quilts, and she is available to teach her hand-sewing methods one-on-one in her home. "Lazy Days on Turtle Creek"
Near the beginning of the year, Karle was given a pattern for fabric origami frogs. She didn't care for how they turned out, but it got her searching for others on the internet. Loving turtles, she discovered and modified this cute origami shape. 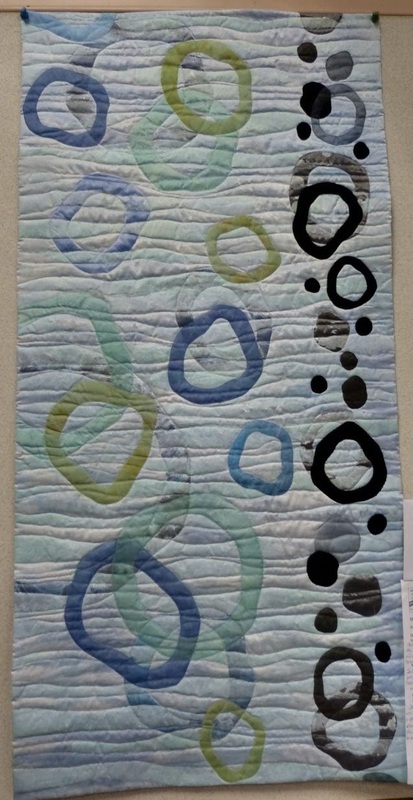 Karle used several new techniques in this quilt, including 'bubbling' the fabric, making samples to get the texture and scale she wanted. Fabric origami and thread lace were new to her as well, and she had fun playing with them. 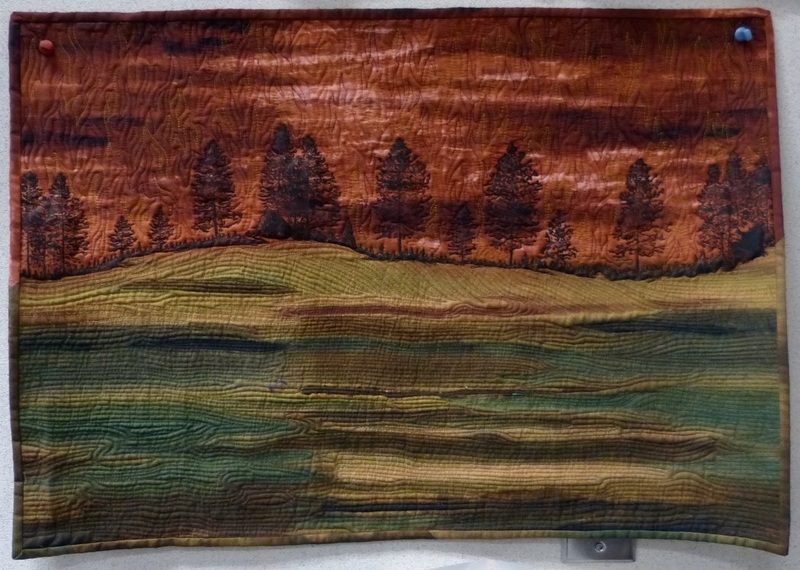 According to Karle, the density of quilting and thread painting of the tree branch in contrast to the areas not quilted beneath the log created problems with getting the surface to lie flat. 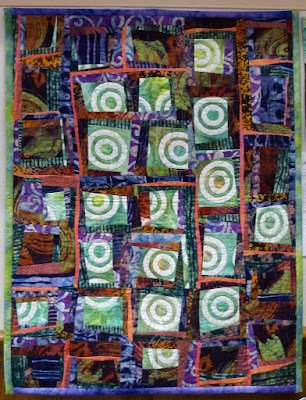 She tried to remedy this by adding more quilting but still was not satisfied with the results. An even bigger challenge was taking the concept she had sketched and transforming that into fabric within the time allotted. 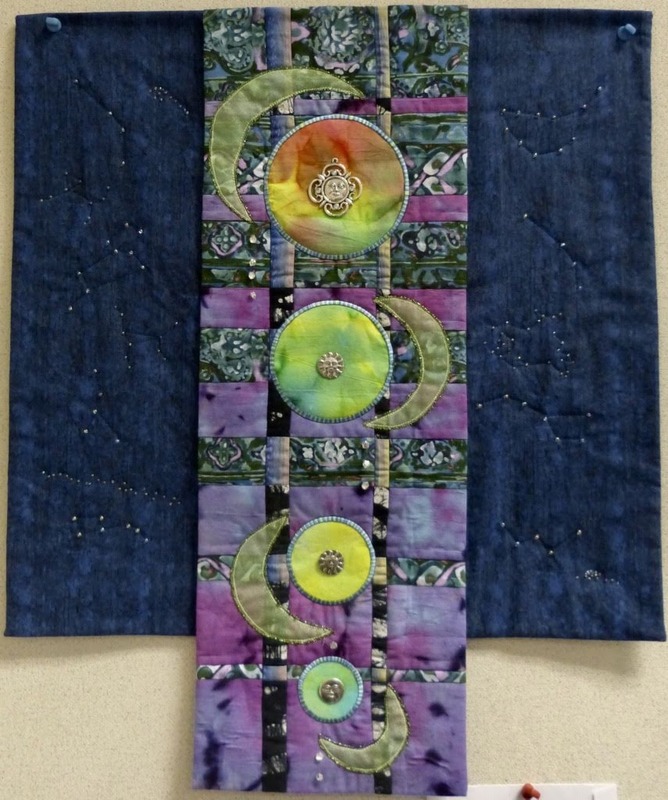 Karle used commercial batiks and hand-dyed fabric, fabric origami, thread lace on Solvy, Terial Magic, starch, textured thread and yarn, and beads. Julie was inspired by the beauty of our earth and how something like the aurora exists for merely seconds or minutes. In this quilt, she was trying to capture the ethereal phosphorescence of a phenomenon found only in the northern skies. 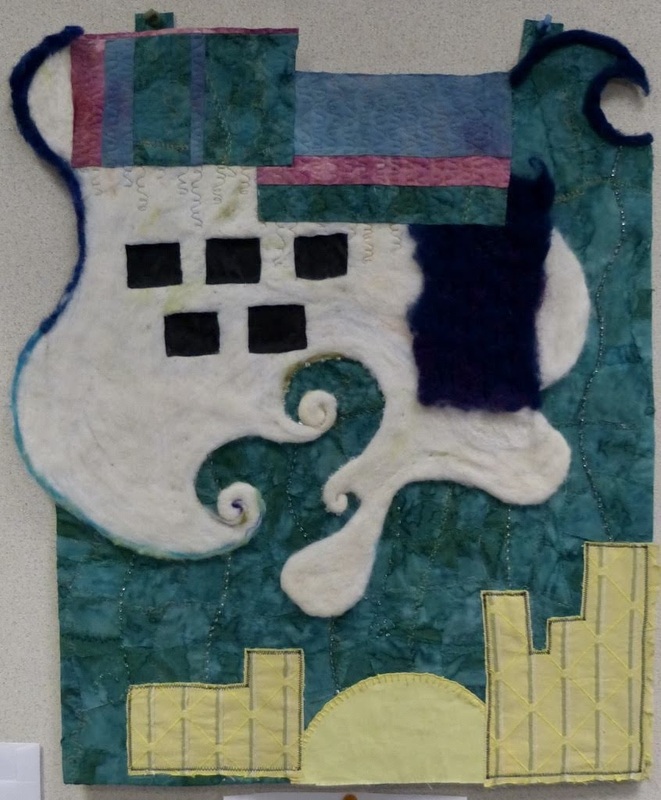 This quilt was based on many images of the northern lights -- taken from the internet, books, and the Aurora Museum in Anchorage, Alaska. 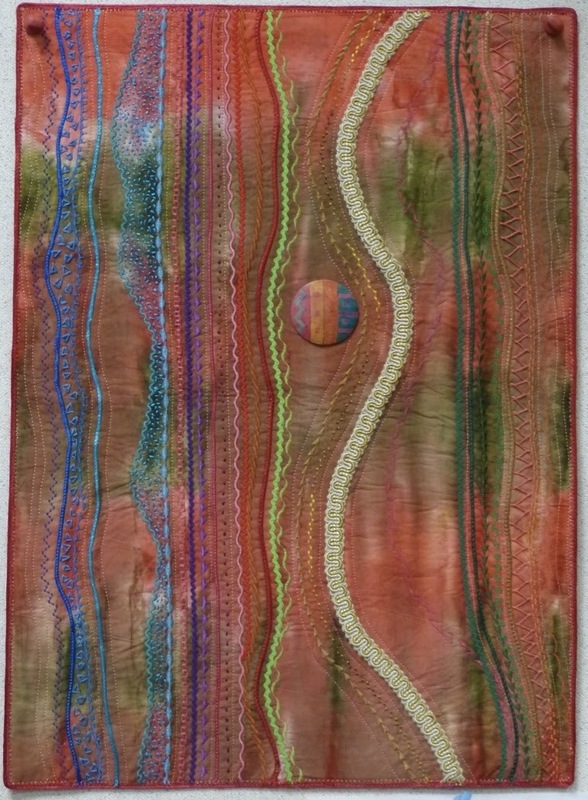 Julie used cotton fabric, organza, tulle, cotton and rayon variegated threads, Copic markers, and wax pastels in creating this image. 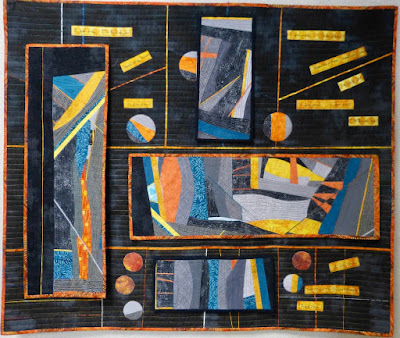 Jan was inspired by an abstract painting to create something abstract herself. 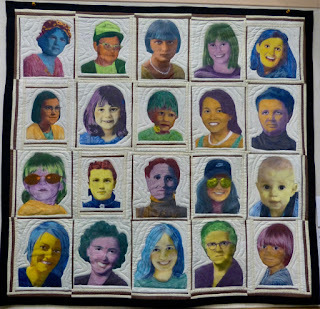 Known for her realistic quilts, she challenged herself to create something outside of her comfort zone. Jan decided to use fabrics that implied transparency in the areas where the shapes overlapped. Originally, she had the turquoise background surround all of the shapes but ended up cutting the quilt top down to better engage the edges. 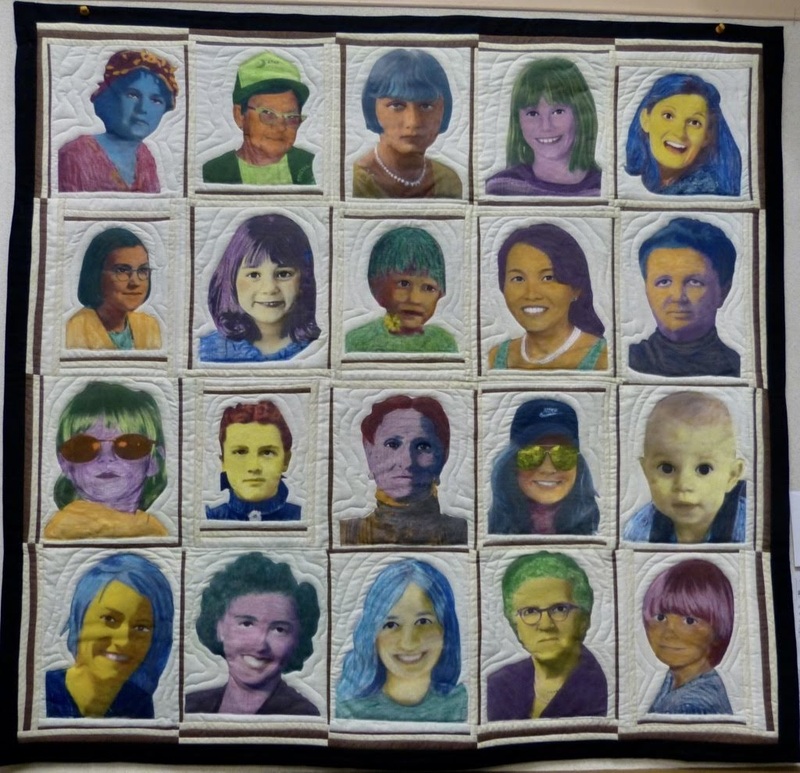 The quilt was made using batiks, beads, and monofilament thread. Norma was inspired by Piet Mondrian, 1872-1944, a Dutch painter who was one of the pioneers of 20th century abstract art, to create this original design of her own. While all of Mondrian's paintings of which she is aware are composed of vertical and horizontal black lines forming blocks of mostly primary colors, Norma decided to draw her design on a angle using a draftsman's 45 degree plastic triangle. She cut each section out of freezer paper and ironed it to her fabric, leaving a 1/4 inch seam allowance. She then sewed the sections together with 1/4" lines of separation. Because her edges were on a bias and could easily stretch, Norma used spray glue to hold the top and backing to the batting to stabilize the edges. 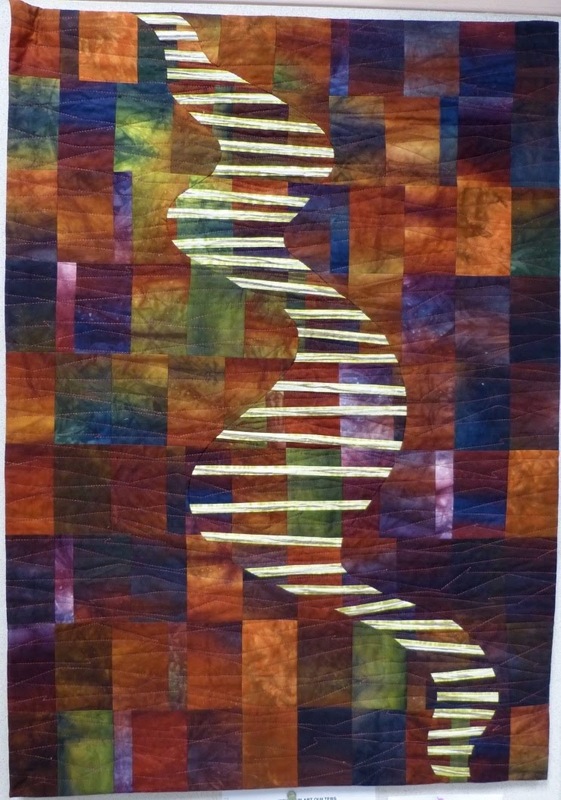 She machine quilted the piece using different patterns in each of the sections. Norma used commercial cottons, Thermore 100% polyester batting, cotton and polyester threads. A favorite verse inspired this design by Karla, "When my anxious inner thoughts become overwhelming, your comfort encourages me." Psalm 94:19. Karla's goal was to create a visual abstract representation of the difference between the chaos of anxious thoughts and the ensuing peace that occurs after taking those thoughts and concerns to God in prayer. She used Sharpie pen, isopropyl alcohol, rickrack, cotton fabrics, monofilament, Magnifico and King Tut threads, and Hobbs Heirloom 80/20 batting. Karla says that one of the joys in creating this piece was using a new finishing technique. She used a satin stitch to attach the large rickrack in lieu of a binding or facing. Unfortunately, the rickrack stretched as it was being applied and she ended up blocking the piece to square it up and make it lie flat. 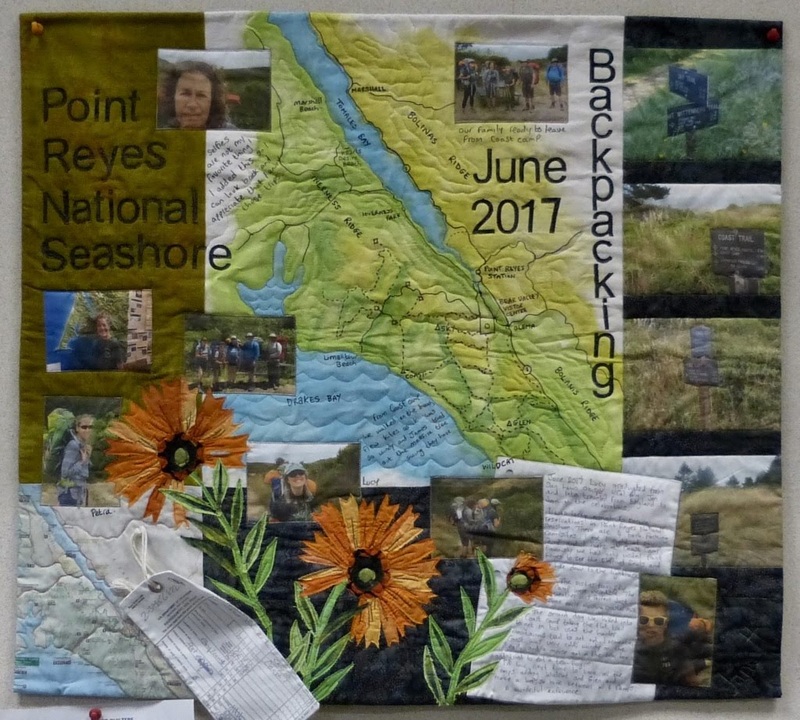 The SAQA challenge "Shifting Tides" and its focus on the current state of the Pacific ocean was the inspiration for this quilt by Sigrid. She chose to focus on the continuing oil leaks, knowing the tremendous destruction they have done. Sigrid found it difficult to think of the ocean in an abstract way as the ocean and everything about it is such a strong visual. She ended up narrowing it down to very simple shapes that represent the water as it begins to recede on the beach leaving lines of bubbles, which she represented as circles. Sigrid used tissue paper laminated with acrylic mat medium on poly organza, dyes, paints and fusibles, cotton poly and silk organza, netting and interfacing. "If the Earth Were Flat"
Sandi was driving down highway 1 in Pacific Grove watching the sun go down when she started thinking about what might happen if the earth really was flat and the sun simply fell into the ocean. 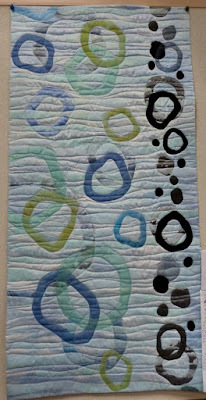 She decided to play with that idea in quilt form, experimenting with felting to produce the swirling effect on water. She ran into difficulty felting through the cotton fabric/felt layers and ended up cutting the piece apart and hand-stitching it back together. 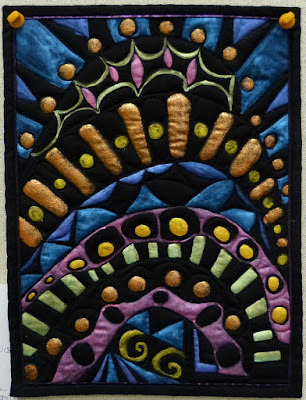 Sandi used cotton and synthetic fabrics, needle felted wool roving on synthetic felt, cotton embroidery and metallic threads, beads, machine embroidery with variegated threads, and foam board backing for support. 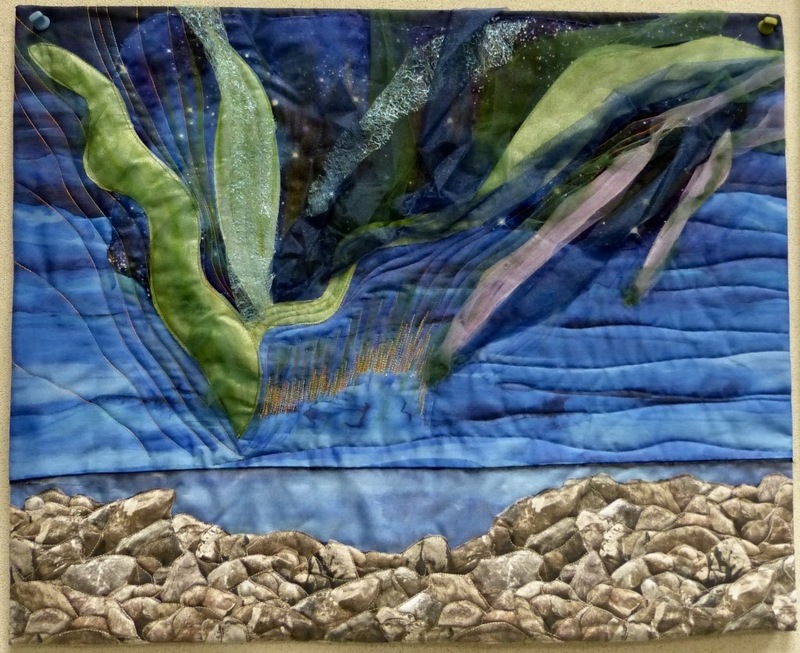 "Precarious Path Through a Dangerous World"
Joan's second piece in this reveal represents the need to flee from tyranny, hunger, and natural disasters. In Joan's words, the terror and uncertainty of running from imminent danger is palpable. Whole communities outrunning a hurricane or forest fire are terrifying, but having to leave your homeland because of hunger or tyranny is far worse. 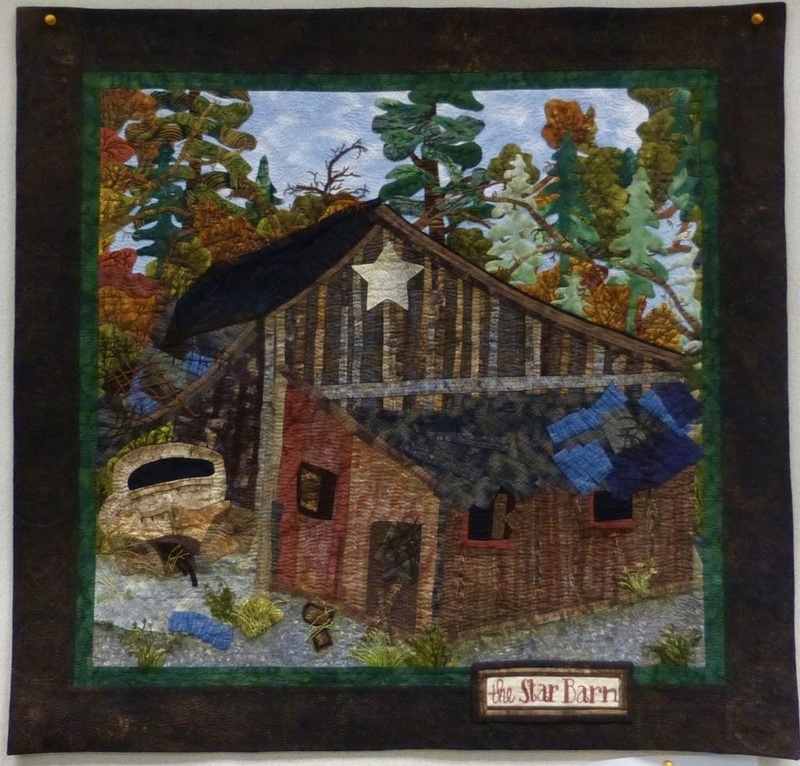 This quilt, with its foreboding background, expresses the feeling of unsafe steps leading to an unknown destination. The desperation and desolation of fear prevails. The attain this mood, a dark hand-dyed fabric was pieced with rigid rectangles. Then two wayward cuts determined the path across the piece. The was cut unequally and inset with strips of green Shibori, dyed by the maker. More texture was desired so a search for new materials produced two colors of folded paper ribbon which were glued onto the Shibori. The finished center section was sew onto batting and backing. The two side sections were hand-appliqued onto the center. A severe pattern of machine quilting adds to the tension of the piece which was finished with faced edges. Mary chose to do butterflies and dragonflies on an abstract background. She loves working with brights on black fabrics. In addition to the cotton fabrics, Mary used cotton batting, beads, cotton, poly and nylon threads. According to Michelle, this challenge forced her to take a long, hard look at abstract art. She knew how the finished piece would look but did not know how to get there until a Katie Pasquini Masopust lecture gave her a place to start. Michelle took a photo of a poppy quilt she has hanging in her home then used a piece of tracing paper with a grid of 20 squares. She pieced together 20 log cabin blocks roughly depicting each section. Once she added the dark strips, it all came together. Michelle made a series of abstract weavings decades ago and found the key to them was simplicity. 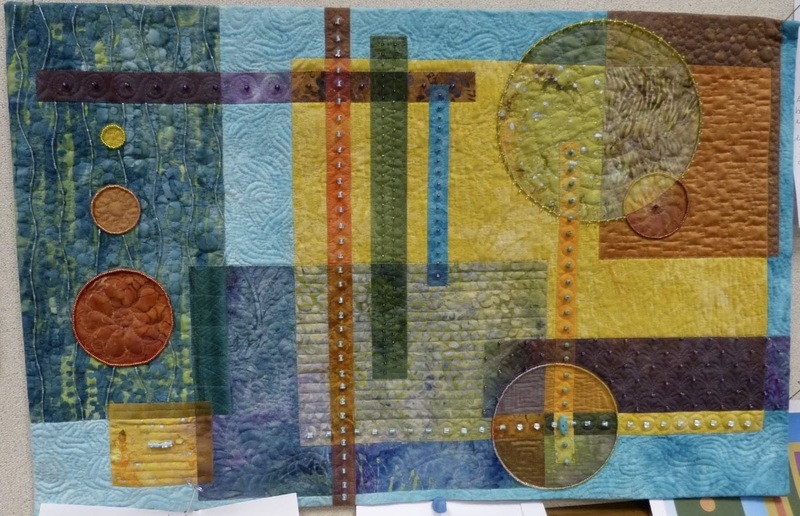 She also took Brenda Gael Smith's circle class at PIQF and her book Copa Abstractions gave her the final key to abstracting quilts. 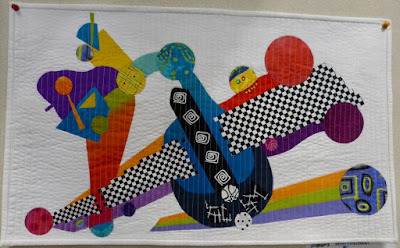 Robi based this quilt on her daughter's doodle and says it would also fit well in a category of Driven to Distraction. It took a while for the idea to come to Robi, who ended up taking liberty with the doodle, hence the quilt title. It also looks a bit like the crown of the Statue of Liberty. Robi used black Kona fabric, Warm and Natural batting, metallic pigment powder and textile medium. Kari's inspiration was Wassily Kandinsky's "On White I" from 1920 and her stash of silk and cotton solids with three sizes of black and white checks. As Kandinsky grew beyond his Blue Rider period, he believed form was no longer a thing but emotions to be listened to. Colors and shapes became seeing sound and hearing colors (synesthesia). He saw yellow as the sound of a trumpet, light blue as a flute, medium blue as a cello, and dark blue as an organ. He liked to say, "Lend your eyes to music," and "everything starts from a dot." This quilt was inspired by an article Carol read on how urban plans often go astray. 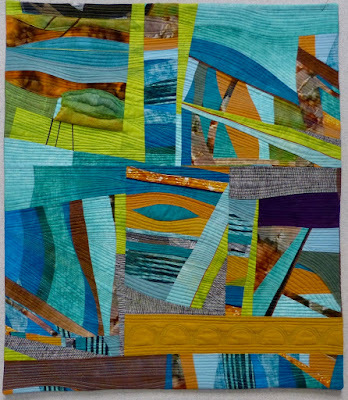 This abstract quilt, as yet unnamed, was inspired by the colors at Yellowstone -- the oranges, teals, and limes in the pools. 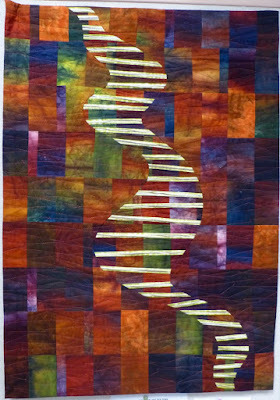 Carol experimented in this quilt with a trapunto effect. 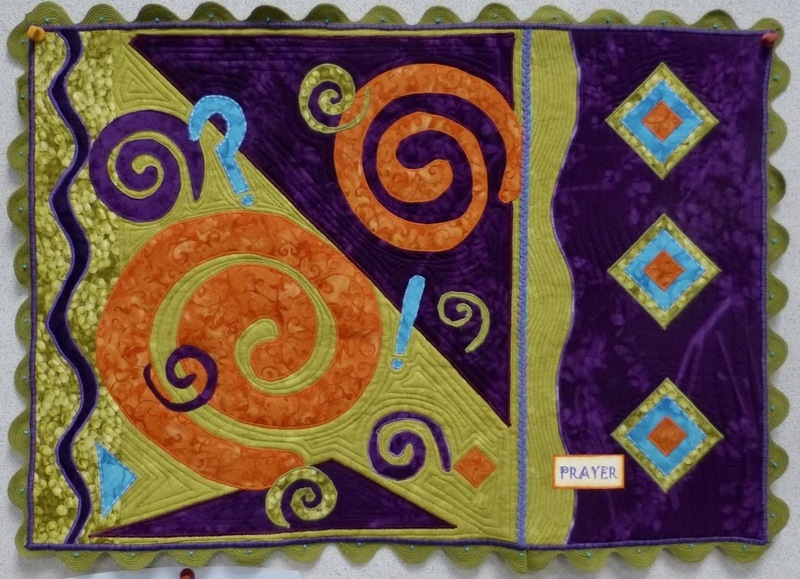 "Take Back the Color Orange"
Also by our new member, Carol, this quilt started off as a totally different quilt. Unhappy with her original quilt, Carol slashed it apart and sewed it back together. The quilt is still unfinished. Carol has plans to create things underneath, surprises that represent issues that concern her. 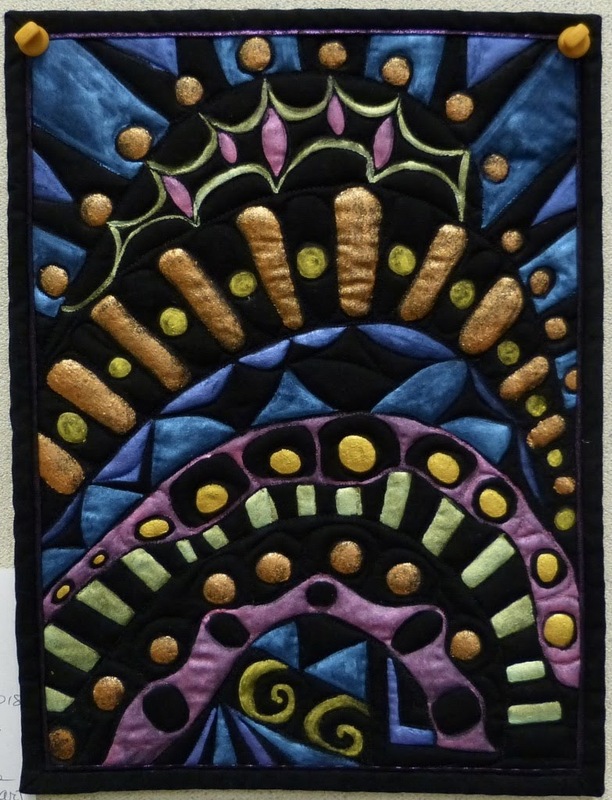 Jan's quilt, which was critiqued by Larry Ortiz back in May, was enhanced to create a stronger light source and entered in the International Quilt Association judged show in Houston, taking an honorable mention. Way to go, Jan! 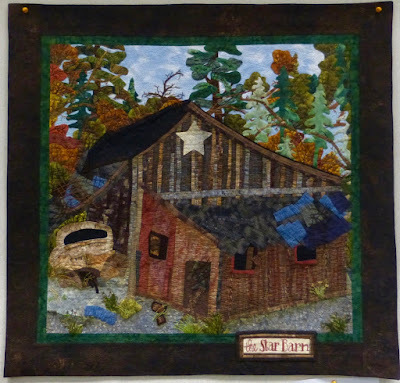 If the win in Houston were not enough, Jan also scored a third place in the wall quilt category at PIQF. Double kudos, Miss Jan!